Fred+Ginger is a sophisticated fitted cardigan with set in, three quarter length sleeves and softly ruffled edges. The lightweight ruffle is worked in dyed to match cashmere silk laceweight for a fun feminine twist on the basic cardigan. Twisted ribbing completes the buttonbands and collar. Shown in size 37” / 94cm with no ease. Technical Editing by Jaya Purswani. Ruffle: 1 skein, all sizes. Each 7 page colour PDF includes photos, schematic and abbreviations. This pattern features fill-in forms – fill in the numbers for your size! This pattern is split into 2 files – one contains sizes 31-41”, the other 43-55”. You will receive both files. Cast on, knit, purl, increase and decrease, knitting in the round. Suitable for an intermediate knitter. Super cute cardigan! I love it! Definitely adding this to my list of must knits. This is the cutest cardigan EVAH. Love the lace addition, and anything orange is a hit with me. I’ll definitely be making this one. I love this cardi – such a classic! absolutely gorgeous and i love love love the ruffle. very sophisticated and cute at the same time :) also love the colours you chose – they look awesome. Love this! The ruffle edging adds the perfect little feminine touch. Cute! I love the colour and the ruffled edge. this is beyond perfect… the ruffle is the perfect touch, not to mention the yummy color! It’s just gorgeous Laura! This cardigan is very pretty and you look great in it. Great design and it definitely suits you! LOVE it! It’s really beautiful! Another creation with a lot of stockinette stitch ;-) Congratulations! Very cute, I love the little details! Laura you just keep getting cuter! The ruffle is such a nice touch. In the long shots it looks like a ribbon – what a nice effect. I love this! It is super cute, and while I want to make your cityscape cardigan, I am much more likely to get this one done in a timely fashion! GORGEOUS cardigan. Lovely photos. Very nicely done. 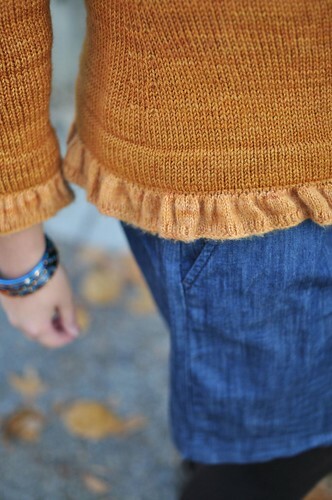 Love the little ruffle and the color.